The Stormwater Utility provides a means for moving and redirecting water away from roadway surfaces and the surrounding right of way, toward storage areas or flow lines and releasing it toward natural drainage corridors. The system includes curb and gutter and storm sewers throughout the Central Business District. The remainder of the system consists of grass swale, ditch and culvert type flow lines. Our Stormwater Utility is not set up as a combination sewer (sanitary and storm sewer), it is strictly for conveying storm runoff and other clear water. For that reason, please refrain from dumping anything down any storm inlet or using an inlet as a garbage can - these lines typically flow directly to our wetlands and waterways. 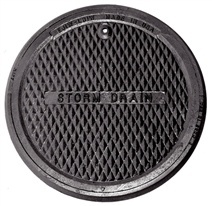 Billing of storm sewer user fees are done on a quarterly basis, coinciding with water and sewer billing, in March, June, September and December. We now have e-Check Payment available for your Utility bills. Click here to navigate away from this page and setup or access your account.